One day, as Alan Joaquin surveyed the landscape of his native Hawaii from his perch in the pilot seat of a Hawaiian Airlines jetliner, he had a revelation. Joaquin, an entrepreneur since his teen years with a strong interest in horticulture and environmental restoration, was looking for another place to literally “roll out” a modular urban farming system he had been developing. Joaquin, now a commercial airline pilot, got his start in business in his teens and early twenties as a commercial landscape contractor focusing on ecological restoration, and developed an erosion blanket product to rehabilitate stream banks and facilitate native species restoration. About six years ago, when Joaquin’s newborn son arrived, he began to feel strongly about feeding his family organic food, which was hard to come by in Hawaii and very expensive. “I realized if I was going to feed my family organic food, I needed to do it myself,” he says. So Joaquin developed an offshoot of his erosion control system to grow food in aboveground, modular sausage-like packages, naming it “Wiki Garden.” Wiki means fast in Hawaiian. The system came with all organic growing media, nutrients and seeds self-contained, requiring only to be hooked up to an irrigation source. “The idea was to create a product to allow people without a background in horticulture or organic agriculture to easily grow their own food,” says Joaquin. Joaquin began selling the Wiki Garden kit at hardware stores, farmer’s markets and trade shows, but people were more interested in cheaper technologies like old tires, bucket gardens, and raised beds. Joaquin began to wonder if he was sending an eagle to do a sparrow’s job. So he began to look for other applications for the technology. One day, while viewing the rooftops over Honolulu, the light bulb went on. So Joaquin began thinking about how to adapt his system to take advantage of all those wasted rooftops. Joaquin looked at a rooftop farming feasibility study completed by Bay Localize and determined that the major barrier to feasibility was technological: he needed to create a system that was lightweight enough to work for many types of roofs while being productive enough to be cost-effective. So Joaquin put his engineering hat on and once again retrofitted his system. 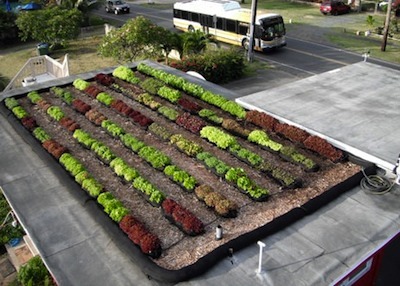 Joaquin’s rooftop farming system is as light as a solar water-heating panel. The growing media and physical structure was reformulated to reduce weight while conserving moisture and cooling roots on hot, windy rooftops. The first implementation was at an old gas station turned organic café in 2010. “It was highly symbolic to turn that old polluting gas station into a sustainable business,” says Joaquin. That rooftop farm became the first-ever USDA-certified organic green roof. FarmRoof has also established several additional rooftop farms in Hawaii, including at a homeless shelter and a hospital, which provides produce for patients. While Joaquin has received a lot of interest, no one seems to have the money to invest in the system. “They try to get grants or philanthropy, or Kickstarter campaigns, but at the end of the day, nothing’s happening,” he says. So Joaquin decided to look at the product through a different lens. He compares rooftop farming to solar energy; while the technology is functional, the cost and perceived risks are still too high to develop a market without government subsidy. The system costs, on average, $25-$30 per square foot, which is on par with other green roof systems. So Joaquin is building his own subsidy, through a new holistic, organic energy drink he is rolling out called Gr3N Energy. Proceeds from sales of the drink, made with kale, green tea and coconut water, will subsidize rooftop farms in Hawaii. For every can sold, Joaquin pledges to plant one kale seedling on a green roof, likely through grants and partnerships with building owners, entrepreneurs and nonprofits. In this way, he hopes to increase buy-in and slowly build a market for FarmRoof. While Joaquin has a patent on the technology, he wants to share it, because he doesn’t think it will make a difference otherwise.